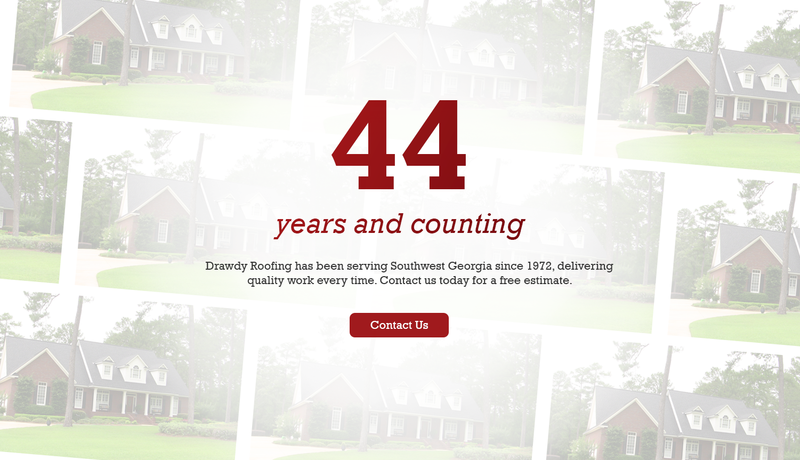 How long has Drawdy Roofing & Vinyl Siding been in business? Since 1972 we have been serving Albany, Leesburg and all of Southwest Georgia. What services and products are offered by Drawdy? Residential and commercial roofing, vinyl siding, replacement windows, seamless gutters, and patio additions including sunrooms, screened porches, patio awnings, and carports. Does Drawdy Roofing and Vinyl Siding carry Workers' Compensation and General Liability Insurance? Yes, and we provide the certificate with your estimate. Home and business owners can be held liable for damages or death of a worker from a company that is not insured. Individual workers' comp certificates of insurance are just that: they cover one person. So if there are several workers on your roof they must all be covered under the company that gave you the estimate. Always ask to see a copy. Four words describe this roofing company 1) Professional 2) Efficient 3) Organized 4) Superior quality work. The man who came to give me an estimate is a licensed adjuster, Bobby Spargo, so I felt confident there would be no materials padding (as there was in the other estimates). He printed out the estimate from a laptop computer before he left my house. The roofing crew was able to work me into their schedule with in 10 days. They removed the old shingles, laid new felt/shingles, new boots for the vent stacks and replaced two off ridge vents in 6 ½ hours. Clean up was SPOTLESS. I would recommend Drawdy to anyone."